"The Best Sealer For Stone Walls!" ProtectGuard is the flagship sealer in the Guard Industry range and with good reason. 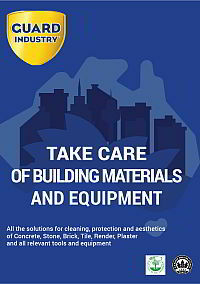 It is a full penetrating sealer that does not alter the appearance of the stone. Yet, it makes the surface highly repellent to water, oil, stains and even graffiti. Plus, it's water based, safe to use and environmentally friendly. It even comes with an impressive 10 year guarantee. ...BUT THAT'S NOT EVEN HALF OF IT! Guard Industry offer a 10 year guarantee on the performance of ProtectGuard. This sounds great! But how 'water tight' is this guarantee? Many sealer manufacturers promise much but deliver little. This isn't the case with Guard Industry. They have numerous case studies that demonstrate that their products not only meet expectations, but far exceed them. One project that shows this particularly well is the HSBC France headquarters, located on the Champs Elysées in Paris. However, what makes limestone so good for sculpting, makes it horrible to keep clean. Porous limestone exposed to the elements creates the ideal conditions for algae, moss and mould to grow. These dark biological growths stand-out in bold contrast to the light coloured stone. Not only are they unsightly, they also accelerate weathering and erosion. Unprotected limestone will begin to turn black in the first few months of winter. Permanent staining occurs within just a few short years. In contrast, the facade on the Paris HSBC headquarters still looks like new. Stonework sealed way back in 1995! Without any reapplication, or even any cleaning, the walls still look great. The images in this article were taken in 2018. For more than 20 years ProtectGuard has protected the limestone on this building and kept it looking like new. 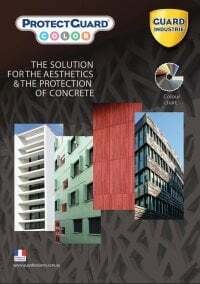 More than 20 years performance, on a product that Guard Industry 'only' guarantee for 10 years! That kind of durability is impressive to say the least. To put this in perspective, most topical sealers available in Western Australia which are marketed specifically as "limestone sealers" will last for 2-3 years, maximum. We know, because we've tried them. 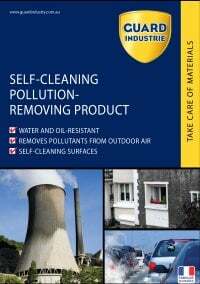 I previously owned and operated a pressure cleaning business in Western Australia. I've seen and cleaned a lot of dirty limestone. It is extremely difficult to keep clean and most sealers are just simply ineffective at providing that kind of protection. 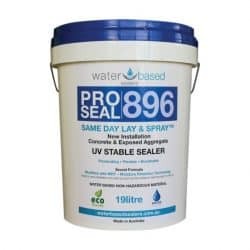 So even if you just stick to the guaranteed 10 years time-frame, ProtectGuard lasts at least 3 times as long as an average limestone sealer. However, the performance doesn't stop with durability. ProtectGuard repels water oils, grease, staining and even graffiti. Your average limestone sealer will provide some protection against water and stains but won't keep out oils and grease and is completely defenceless against graffiti. ProtectGuard has a unique fluorinated co-polymer chemistry that repels all kinds of liquids. The sealer stops stains from penetrating into the stone, providing protection no matter what is thrown at it. If they don’t simply bead off themselves they can be removed in most cases with just a damp cloth or a low pressure wash-down. For safe graffiti removal use GraffiGuard Eco 2030 to safely and easily remove graffiti without damaging the sealer. Breathability is extremely important for external sealing products. If a sealer doesn't breathe, any moisture that gets into the surface cannot get out and all sorts of problems can occur. 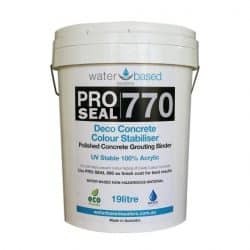 These include bacterial growth, rising damp, efflorescence, salt spall, erosion and premature sealer failure. 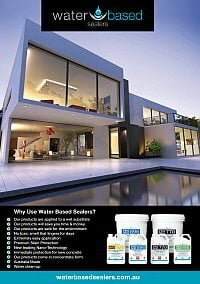 It is true that one function of most sealers is to keep water out. However, achieving this in an outdoor setting is extremely difficult. Dew, driving rain, and splashes can get in through gaps between stonework. Overflown gutters can send water down cavities. Rising damp can bring moisture up from the subsoil into the stone. Any point where the stone is not completely encapsulated or impregnated with sealer is a potential entry point for moisture ingress. 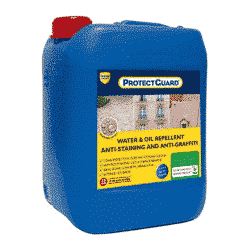 ProtectGuard repels liquids but it does not inhibit release of water vapour at all. This means that water droplets will bead from the surface. While moisture in the stone can freely escape by evaporation. Protect it with a sealer that does what it says it will. Protect it with something that will stand the test of time. ProtectGuard from Guard Industry simply is the best sealer for stone walls!